Today in 1929, British scientist EA Murphy, who worked at the Dunlop Latex Development Laboratories in Birmingham, must have been a little bored, or mischievous, because he decided to whip up some latex rubber with a kitchen mixer. As is often the case with such seemingly arbitrary actions, he ended up inventing a product that, up to this day, has a huge impact in all our lives – foam rubber. It is said that Murphy’s colleagues were initially unimpressed, but this soon changed when they caught on to the amazing cushioning and shape retaining properties of this new invention, and it wasn’t long before foam rubber was used in motorcycle and car seats, mattresses and much more. In its natural form, latex is a milky white liquid tapped from the trunks of rubber trees. This pure latex gets whipped up with water to create a thick froth. The froth is sometimes exaggerated using CO2 gas. Once frothy, the mixture is heated to the point of vulcanization (about 240°F) which results in the formation of long molecular chains with strong crosslinked bonds, giving the resultant foam rubber its ability to recover its shape after compression. 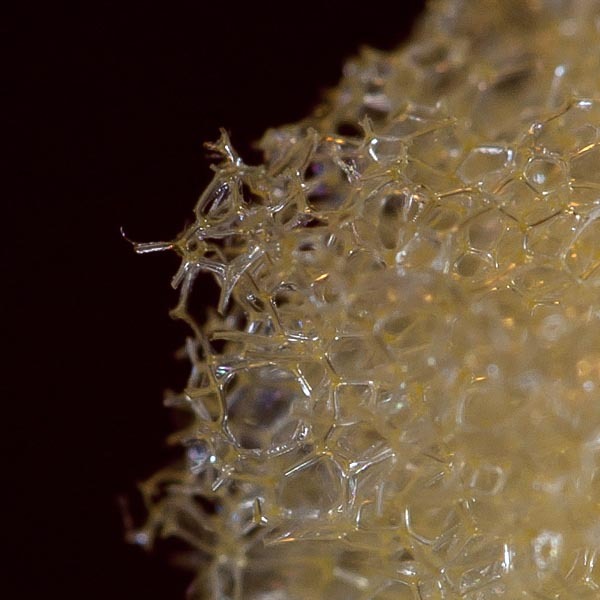 Close-up view of frothy foam rubber. While the shape retention characteristics of foam rubber make it a very versatile substance, it does have some limitations. When it gets exposed to very high temperatures it will melt, and if its frozen it can shatter. Now researchers at the National Institute of Advanced Industrial Science and Technology in Japan, have come up with a new carbon-based nanotube rubber that has even better shape memory than foam rubber, and that can withstand extreme temperatures without any negative effects. The unique features of this new super-rubber make it ideally suited for use in extreme conditions like spacecraft and car shock absorbers. Incorporating it into clothing also means that you can have a truly non-wrinkle shirt. Perhaps most exciting is the electricity conducting abilities of the carbon nanotubes, which means that, if its used in shoes or shock absorbers, the material could theoretically harvest and store the electricity generated. While high costs mean the large-scale application of these super-rubbers are still some way off, one can just imagine it becoming as pervasive as foam rubber over the next decades. Thanks for the kind feedback, Zunaida! Pingback: Patent Plaques, Patent Cubes, Patent Awards, IP Plaques, IP Cubes and IP Awards » Blog Archive » Rubber Never Sounded So Cozy; Thanks EA Murphy!